My first gun has been purchased, a Remington 870 "combo" shotgun with scope. The term "combo" refers to a gun with interchangeable barrels -- one for sabot or slug shots and the other for buck shots. It's for "security" purposes only; I am not a hunter. 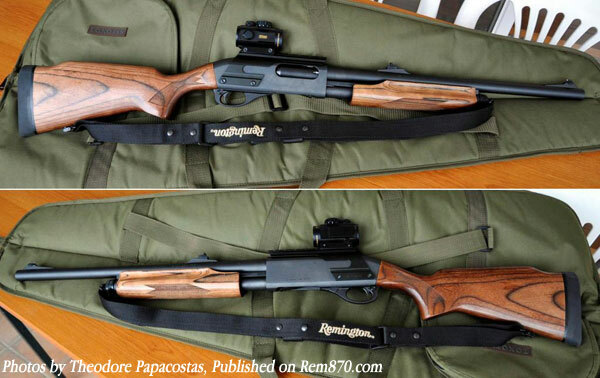 piston wrote: My first gun has been purchased, a Remington 870 "combo" shotgun with scope. The term "combo" refers to a gun with interchangeable barrels -- one for sabot or slug shots and the other for buck shots. It's for "security" purposes only; I am not a hunter. I prefer Italian myself. Figure all those Mafia guys must have assisted with some R&D. Had to "hand in" my semi-automatic Beretta years back with our stupid gun laws. I use a Perazzi over-under now - look out clay pigeons! Good one! According to some gun experts, guns are preferable to rifles, even in the bush, because of faster maneuverability. One such experts recommends a basic .44 even with bears. My problem is eye sight. I don't see very good, certainly not at a distance. That's why I went for a shot gun. Within fifty yards, five shots, with magnum slug power. Just pump and shoot. The Remington is not marketed to kill a bear but I figure I can slow down one with these five shots. It's getting a bit crazy here with all these out -of - staters looking for blood but not caring about the outcome of what they shoot. The bear hunt is now a commercial attraction in Maine, a source of money for the state. I have never worried about bears before but you know what they say about a wounded bear: it's a nasty beast, hard to get down. Why should I risk my own security for some idiot from New Jersey who just wounds a bear? When a black bear comes for you it comes at 30 miles per hour. Forget about them nasty chemical pepper tanks! You've got to break something in that natural tank: a leg, a neck, whatever comes into your angle of vision. And just keep shooting! People with 330s did not get it killed after 8 shots. Lots of muscle in a charging bear. I've thought about getting one, but I live in a building with security and also right across the street from a police station. If I ever get one, it will be more for my protection when I'm out around town than when I'm home. And actually, I don't even know what PA's status is as far as the legality of concealed weapons. But given the big gun culture in western PA, I assume it's legal. I used to hunt feral pigs and the like through the bush, but as I age I prefer to pick off clay targets then retire to the clubhouse. I keep the gun at the club - having a gun at home with our laws is a long, expensive and intrusive process. Hence our booming trade in illegal firearms. Never shot a bear. Shooting koalas is illegal, and they are far too cute to shoot. A koala going for you is not quite like a grizzly or black bear (and koalas can scratch like a wild animal if you try to cuddle one that isn't in a zoo). Shooting roos (we have plenty of reds and greys - they are pests in these parts) is fun and difficult due to their bouncing gait - and a big red Boomer can do serious damage to a person, although again not like a grizzly or cougar. I recall one day when a bunch of us were out hunting and didn't find a thing all day. We walked around a bend, each armed like a Rambo fantasy, and found an entire hillside covered in kangaroos. No way you could miss. So we opened fire with everything we had, spraying hot lead death into the helpless, crowded mass of flesh. A cloud of gunsmoke cleared . . .
And we threw our guns down and fell over laughing. Couldn't miss? We couldn't find one drop of blood, let alone a wounded or dead 'roo! Brendan wrote: I used to hunt feral pigs and the like through the bush, but as I age I prefer to pick off clay targets then retire to the clubhouse. I keep the gun at the club - having a gun at home with our laws is a long, expensive and intrusive process. Hence our booming trade in illegal firearms. Hunting always sounds so simple but it ain't. keepint territory is another matter. This is your space. Anything intruding is fair game. My dog is almost wolf. One night I saw him take off, like a bullet, for something in the dark. Curious feeling! Is that thing bigger than you? Life in the wilderness brings forth the necessity of knowing what to do. It's that simple. Piston, rifles are long range weapons and unless you are living on an estate that covers a substantial area your weapon will be basically useless if you intend to use it indoors for your protection. Do you hold it sideways gangsta style? What a pathetique thread. Seriously are you guys real ? No offense to you my friends(you all are) but now I truly have seen everything on CMG. ravel30 wrote: What a pathetique thread. Seriously are you guys real ? Guns are a big part of the culture in many parts of the U.S. I see nothing wrong with discussing them. It could be worse. Someone could start a thread on his or her favorite flowers. Hmm, for some reason that post makes me want to listen to Beethoven's Piano Sonata No.8 in C minor, Op.13. Or maybe Tchaikovsky's Symphony No.6 in B minor, Op.74! Seriously, though, we are all very real! That post is highly offensive. I love when people think they can post whatever they desire and be immune from it because they said "no offense". I suggest you come live in New Orleans, where there are multiple murders per day and endless cases of home invasions. We'll see if you change your tune on gun ownership, then. I'll be ready if someone decides to invade my home, and they will be greeted with a nice "double tap"! Barry wrote: Guns are a big part of the culture in many parts of the U.S.
Love my Perazzi over-under, and Fuscias are my favourite flowers - except when Mum's Rose is in full bloom. I seem to have a lack of interest in visual things that inspire many people; be it art, scenery, flowers, opera, etc. But how can one not like a hanging basket of overflowing colourful blooming fuscias? Beyond me. Brendan wrote: Possibly a good thing. I'm too busy watching one of my local teams or too focused on whatever I'm eating to notice things like flowers. Umm. . . it's like, at the window or back door and in your face . . . unless you don't water the poor things. Brendan wrote: Umm. . . it's like, at the window or back door and in your face . . . unless you don't water the poor things. From the time I moved out of my family's home many years ago, I never had a plant or flower in any of my apartments until I got married a few years ago. Now my bedroom is like a garden, but I don't pay any attention to it. My wife does all the watering. The thought of buying a long-range rifle never crossed my mind for two reasons: I'm as blind as a bat and I have no interest in hunting big game or small animals. The gun I've purchased has an accuracy range of about 100-150 yards; if I have to use it it'll be for a shorter distance than that. As I said, above, it is a "life insurance policy" against aggressive wounded black bears (courtesy of inexperienced bear hunters who are too cheap to hunt with an experienced guide) and the ever possible night attack of criminals who would see a car-less camper, far away from civilization, as an easy prey. I don't know if you have ever seen the great movie classic "Deliverance" but, if you have, try to imagine the outcome of the scene when the canoeing party is attacked by two crazy mountain men if they had not had the means to defend themselves. Not pretty!!! I sure may understand that ch1525 but I am sure that a lot of Americans are proud of their country and they that it is the best in the world and all. But how can people be so proud of their country when owing a gun is perfectly normal for protection purposes ? How did it get to that point ? Canada is not a perfect country either but at least most people that own a gun are hunters and there are no need to own a gun for protection. Guns ownership and all that are all concepts that are completely alien to me. And if you even need that in friendly states (and close to Canada) like Maine well I think that it is pretty sad. And the worst is that there is something going terribly wrong going on in the Gulf of Mexico right now and nobody here gives a dawn about it (except for one thread that happened a few days ago and nobody cared about). I certainly have seen this classic movie. Now Jacques, of all people here I am sure that you understand where I am coming from and understand that it is quite different around where I am from. Does it mean that I should carry some guns when I go camp and hike in the Adirondacks ? Or the Appalachians on the East coast ? I think you have been making a moral issue out of a most practical one. The original post of this thread has nothing to do about my constitutional right to own guns, which is an all-too frequent rationale for gun ownership. And I am willing to bet you that a trip to more remote counties in Quebec and in Ontario would reveal that a lot of Canadians behave just like Mainers: they own shotguns and even rifles even though they don't hunt much at all. As I said, it's when people are confronted with the reality of their own defenselessness --whatever the cause-- that they act accordingly. It would be ridiculous not to do so (or not to post here about it, just like any other topic). As for North American urban environments, people have a choice: they can avoid certains cities and inner cities, thus voluntarily restricting their own freedom of movement, or they don't relinquish that right, their constitutional right, and they go wherever they feel like going but mentally and physically ready to face the music! I have chosen the latter many times before at my own risk, without any weapon, a decision which was certainly more stupid than being a small gun owner. To be sure, Detroit is much worse than, say, Montreal but even in my youth relatives would tell us not to go in certain districts of Montreal at night. So, I gather from your comments that you opt for the former decision: avoiding certain areas, certain cities, certain countries. Well, that's your decision. I'm not willing to sacrifice my freedom of movement. Hey, why pick on the gardeners! Anyway I may need a gun too because I'm getting tired of the woodchucks and rabits out here! They've created a "controlled" moose hunt in northern Maine, open only to people living in the agricultural areas where moose are damaging or destroying crops: "you take my food, I take your meat!" Not unusual at all to see deer strolling down the street here, going from one lawn to another and eating flowers, leaves from a bush, etc. And that's in the middle of a small city! Unfortunately, the coyote still has a bad reputation, totally unwarranted in my opinion, but enough to allow hunters an open season for regular hunting all year long, and for night hunting from Dec. till June! People here want it both ways! Kill the coyotes and whine about the growing deer population. watch it and it hits like a minnie sledge hammer only worse. hunters are only shooting at "animals" which aren't human. to for over 50 years. Great testimony, David. I gather you were not part of the early "contingents" to Indochina, right? I cannot say what I would do or not do in a dangerous situation. I do know a thing or two about an adrenaline rush, though, and that I was ready to use a fireman's axe and a big camp knife in a recent past. There's a good old friend of mine, Penobscot Indian man and a Marine too, who served in Korea and in Vietnam. He has seen plenty of combat and, notwithstanding his now venerable age, has such a reputation in his community that much younger men do not ever wish to be taught a lesson by this guy. One evening, at a camp fire, I asked him to show me a hand-to-hand combat move. Oh, we was gentle but I was ready to fall on my knees. In any case, he has already given me some good tips about shooting a shotgun. rulers a few years before and were well acquainted with the French Foreign Legion. wasn't really that interested in sticking around. .357 when necessary for qualification. The recoil is nasty, but not as bad as the good old .45.
about it very much. I didn't consider myself much of a "fighter" and generally avoided violence. the wars of our nation's past. Semper Fidelis. To be sure, David, let us give thanks. And you need not worry about this gun owner. How long did it take me to get there? I think I was 19 the last time I shot a gun, a mere little .410 bird shooting gun. But I have one now and can stand my ground better than before. You wouldn't remember a Maine fellow nicknamed "JoJo" from your days in Indochina? He had some engineering expertise and was sent there in the early sixties. He has passed on, now, but I got to know him before he left us. Barry wrote: It could be worse. Someone could start a thread on his or her favorite flowers. Why not combine both into this one thread? Talk about dangerous situations just last week I finally got to watch a show I had DVR'ed in April--I thought it was just wonderful! "My Lai, directed by Barack Goodman, premieres on The American Experience, PBS, April 26, 9:00 pm Eastern Daylight Savings Time. This review originally appeared in the June 2010 edition of Vietnam Magazine. A new television documentary takes another look at an old subject: My Lai. It's been 42 years since the massacre at My Lai. It was revealed by journalist Seymour Hersh a year later. Few controversies of the Vietnam War have received such overwhelming attention in print and on TV as My Lai. Is there anything new here that hasn't been said before?" Is there anything new here that hasn't been said before?" Not to my knowledge, other than recasting this whole story in the broader perspective of much greater human disasters caused by bombers, far above, and for which the pilots were completely exonerated, nay, applauded. thank a veteran for their service, tomorrow. They have certainly earned it. I was in the hospital in January - as a patient - and two nurses approached my bed. who was easily approaching her 50's, asked, seriously: "What are bayonets?" of laughter, at least from two of us. piston wrote: I think you have been making a moral issue out of a most practical one. The original post of this thread has nothing to do about my constitutional right to own guns, which is an all-too frequent rationale for gun ownership. And I am willing to bet you that a trip to more remote counties in Quebec and in Ontario would reveal that a lot of Canadians behave just like Mainers: they own shotguns and even rifles even though they don't hunt much at all. As I said, it's when people are confronted with the reality of their own defenselessness --whatever the cause-- that they act accordingly. It would be ridiculous not to do so (or not to post here about it, just like any other topic). Oh boy Piston. Using words like freedom, constitution rights and second amendement at every second sentences or so convince me that they totally brainwashed you . It is like you are using their favorite propaganda now. Are you a member of the NRA on top of that ? I think that you and everyone else here should think for two seconds how sad it is that such a nice country like yours is such that you now need (according to your logic) a gun handy pretty much everywhere you go because of all the dangers. My favorite of your sentences is the last one. Seriously. Freedom of movement ? Would you actually consider to go in the worst ghettos of Detroit, New York city, Miami or Los Angeles (just to name them) whether you are armed or not ? What would you possibly want to do there in the first place. Without generalizing, I seriously doubt that having a gun would changed anything to the possible dangers you could meet there. Are you actually saying that you would get a gun just so that you could go there ? Montreal sure has some bad areas but it is so much nothing compare to all the major cities in America. In fact, the crime rates are fairly low here in the major cities of Canada (not only in terms of numbers but proportionnally speaking). I would really like it if anyone here could explain that. Having said all of this, I agree that it is your right for you guys to talk about it if you want. It is also my right to express my opinion about how sad I find it to read a thread on that. There are words and there is also something called substance in a message, It is my opinion that you are focusing so much on some of the words that you totally have overlooked the substance -- the actual message. ... your distinction between the USA and Canada is probably stereotypical, hence my point about people in northern Quebec or Ontario who no doubt own guns not because it is their constitutional right to do so but because it is a practical means of defending oneself in such areas. More bluntly, not everybody lives in Ottawa, yu know! ...my point about freedom of movement is simply this: people can be so scaaaared about the world around them that it paralyzes them, completely! When they go on a trip, for example, they don't explore anything beyond the official, and highly commercial, tour guide. So, who do they meet in these foreign parts? Other tourists, just like themselves!! Ain't that a hoot!!! Going elsewhere to discover oneself. Please give some consideration to my points. On the concept of freedom of movement, here's a little anecdote about a very famous Canadian, Pierre E. Trudeau. He was a world traveler in his youth, very adventurous and, as all those who have knowledge of him will understand, uncompromising in his principles. One such principle was his right to travel wherever he wanted to, including in Turkey and, beyond, in Persia (not sure if it was Iran or Iraq). And, one day, in a remote, ancient location, he was attacked by two Muslim men, with knives! Well, little Pierre played poker with them, skilfully pretending that he had a gun and was ready to shoot them! See, Matt, even Pierre understood the virtue of gun ownership in certain circumstances. The fictitious gun saved his life! piston wrote: On the concept of freedom of movement, here's a little anecdote about a very famous Canadian, Pierre E. Trudeau. He was a world traveler in his youth, very adventurous and, as all those who have knowledge of him will understand, uncompromising in his principles. One such principle was his right to travel wherever he wanted to, including in Turkey and, beyond, in Persia (not sure if it was Iran or Iraq). And, one day, in a remote, ancient location, he was attacked by two Muslim men, with knives! Well, little Pierre played poker with them, skilfully pretending that he had a gun and was ready to shoot them! Thanks for sharing David, very cool.